Here, six quick and easy drinks to make with sweet, fresh peaches. Peaches are at their super-juicy ripest right now. Though they’re delicious grilled, in a pie or simply eaten over the sink, they’re also just right for incredible cocktails. Here, six quick and easy drinks to make with sweet, fresh peaches. When you’re working with fruit, sangria should be the first thing that crosses your mind. This white wine version is extra-fruity and lightly tropical, thanks to the mango. This is a Dark and Stormy that’s light on the storm. Muddled peach and lemon juice brighten up this spicy, rummy cocktail. This variation on the typically ultra-boozy old-fashioned combines rum with muddled peaches, oranges and cherries. For the freshest version ever of the classic brunch drink, puree very ripe white peaches to mix with Prosecco and fresh lemon verbena leaves. Here’s a light and refreshing gin cocktail that owes its slightly savory taste to fresh basil leaves. 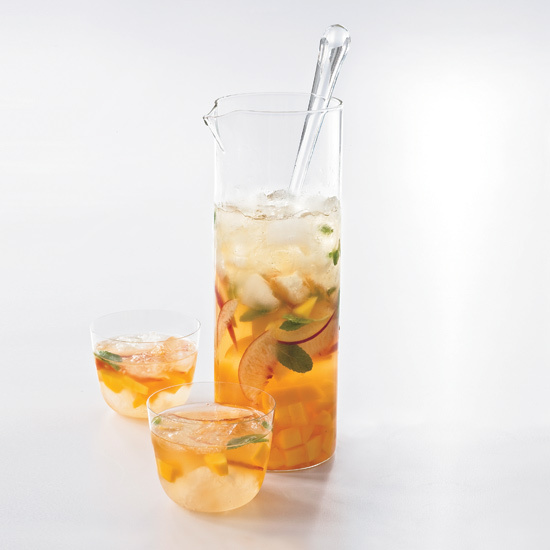 This kicked-up sake cocktail includes gin and juicy muddled peaches.